Ice skating is the self-propulsion of a person across a sheet of ice, using metal-bladed ice skates to glide on the ice surface. This activity can be carried out for various reasons, including recreation, sport, exercise, and travel. Ice skating may be performed on specially prepared ice surfaces (arenas, tracks, parks), both indoors and outdoors, as well as on naturally occurring bodies of frozen water, such as ponds, lakes and rivers. Research suggests that the earliest ice skating happened in southern Finland more than 4,000 years ago. This was done to save energy during winter journeys. Originally, skates were merely sharpened, flattened bone strapped to the bottom of the foot. Skaters did not actually skate on the ice, but rather glided on top of it. True skating emerged when a steel blade with sharpened edges was used. Skates now cut into the ice instead of gliding on top of it. Adding edges to ice skates was invented by the Dutch in the 13th or 14th century. These ice skates were made of steel, with sharpened edges on the bottom to aid movement. The fundamental construction of modern ice skates has stayed largely the same since then, although differing greatly in the details, particularly in the method of binding and the shape and construction of the steel blades. In the Netherlands, ice skating was considered proper for all classes of people, as shown in many pictures by the Old Masters. Ice skating was also practiced in China during the Song dynasty, and became popular among the ruling family of the Qing dynasty. Ice skating was brought to Britain from the Netherlands, where James II was briefly exiled in the 17th century. When he returned to England, this 'new' sport was introduced to the British aristocracy, and was soon enjoyed by people from all walks of life. The first organised skating club was the Edinburgh Skating Club, formed in the 1740s, (some claim the club was established as early as 1642). The metropolis of Scotland has produced more instances of elegant skaters than perhaps any country whatever: and the institution of a skating club about 40 years ago has contributed not a little to the improvement of this elegant amusement. From this description and others, it is apparent that the form of skating practiced by club members was indeed an early form of figure skating rather than speed skating. For admission to the club, candidates had to pass a skating test where they performed a complete circle on either foot (e.g., a figure eight), and then jumped over first one hat, then two and three, placed over each other on the ice. On the Continent, participation in ice skating was limited to members of the upper classes. Emperor Rudolf II of the Holy Roman Empire enjoyed ice skating so much, he had a large ice carnival constructed in his court in order to popularise the sport. King Louis XVI of France brought ice skating to Paris during his reign. Madame de Pompadour, Napoleon I, Napoleon III and the House of Stuart were, among others, royal and upper class fans of ice skating. The next skating club to be established was in London and was not founded until 1830. By the mid-19th century, ice skating was a popular pastime among the British upper and middle classes—Queen Victoria became acquainted with her future husband, Prince Albert, through a series of ice skating trips—and early attempts at the construction of artificial ice rinks were made during the "rink mania" of 1841–44. As the technology for the maintenance of natural ice did not exist, these early rinks used a substitute consisting of a mixture of hog's lard and various salts. An item in the 8 May 1844 issue of Littell's 'Living Age' headed the 'Glaciarium' reported that "This establishment, which has been removed to Grafton street East' Tottenham Court Road, was opened on Monday afternoon. The area of artificial ice is extremely convenient for such as may be desirous of engaging in the graceful and manly pastime of skating". Skating became popular as a recreation, a means of transport and spectator sport in The Fens in England for people from all walks of life. Racing was the preserve of workers, most of them agricultural labourers. It is not known when the first skating matches were held, but by the early nineteenth century racing was well established and the results of matches were reported in the press. Skating as a sport developed on the lakes of Scotland and the canals of the Netherlands. In the 13th and 14th centuries wood was substituted for bone in skate blades, and in 1572 the first iron skates were manufactured. When the waters froze, skating matches were held in towns and villages all over the Fens. In these local matches men (or sometimes women or children) would compete for prizes of money, clothing or food. The winners of local matches were invited to take part in the grand or championship matches, in which skaters from across the Fens would compete for cash prizes in front of crowds of thousands. The championship matches took the form of a Welsh main or "last man standing" contest. The competitors, 16 or sometimes 32, were paired off in heats and the winner of each heat went through to the next round. A course of 660 yards was measured out on the ice, and a barrel with a flag on it placed at either end. For a one-and-a-half mile race the skaters completed two rounds of the course, with three barrel turns. In the Fens skates were called pattens, fen runners, or Whittlesey runners. The footstock was made of beechwood. A screw at the back was screwed into the heel of the boot, and three small spikes at the front kept the skate steady. There were holes in the footstock for leather straps to fasten it to the foot. The metal blades were slightly higher at the back than the front. In the 1890s, fen skaters started to race in Norwegian style skates. On Saturday 1 February 1879, a number of professional ice skaters from Cambridgeshire and Huntingdonshire met in the Guildhall, Cambridge, to set up the National Skating Association, the first national ice skating body in the world. The founding committee consisted of several landowners, a vicar, a fellow of Trinity College, a magistrate, two Members of Parliament, the mayor of Cambridge, the Lord Lieutenant of Cambridge, journalist James Drake Digby, the president of Cambridge University Skating Club, and Neville Goodman, a graduate of Peterhouse, Cambridge (and son of Potto Brown's milling partner, Joseph Goodman). The newly formed Association held their first one-and-a-half-mile British professional championship at Thorney in December 1879. 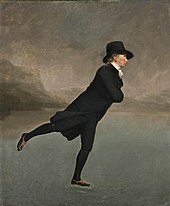 The first instructional book concerning ice skating was published in London in 1772. The book, written by a British artillery lieutenant, Robert Jones, describes basic figure skating forms such as circles and figure eights. The book was written solely for men, as women did not normally ice skate in the late 18th century. It was with the publication of this manual that ice skating split into its two main disciplines, speed skating and figure skating. The founder of modern figure skating as it is known today was Jackson Haines, an American. He was the first skater to incorporate ballet and dance movements into his skating, as opposed to focusing on tracing patterns on the ice. Haines also invented the sit spin and developed a shorter, curved blade for figure skating that allowed for easier turns. He was also the first to wear blades that were permanently attached to the boot. The International Skating Union was founded in 1892 as the first international ice skating organisation in Scheveningen, in the Netherlands. The Union created the first codified set of figure skating rules and governed international competition in speed and figure skating. The first Championship, known as the Championship of the Internationale Eislauf-Vereingung, was held in Saint Petersburg in 1896. The event had four competitors and was won by Gilbert Fuchs. A skate can glide over ice because there is a layer of ice molecules at the surface that are not as tightly bound as the molecules of the mass of ice beneath. These molecules are in a semiliquid state, providing lubrication. The molecules in this "quasi-fluid" or "water-like" layer are less mobile than liquid water, but are much more mobile than the molecules deeper in the ice. At about −250 °F (−157 °C) the slippery layer is one molecule thick; as the temperature increases the slippery layer becomes thicker. It had long been believed that ice is slippery because the pressure of an object in contact with it causes a thin layer to melt. The hypothesis was that the blade of an ice skate, exerting pressure on the ice, melts a thin layer, providing lubrication between the ice and the blade. This explanation, called "pressure melting", originated in the 19th century. This, however, did not account for skating on ice temperatures lower than −3.5 °C, whereas skaters often skate on lower-temperature ice. In the 20th century, an alternative explanation, called "friction heating", was proposed, whereby friction of the material was causing the ice layer melting. However, this theory also failed to explain skating at low temperature. In fact, neither explanation explained why ice is slippery when standing still even at below-zero temperatures. A detailed calculation of the velocity dependence of the friction has shown that the frictional force scales with the square root of the velocity, which can explain why ice remains slippery even at low velocities. A person's ability to ice skate depends on the roughness of the ice, the design of the ice skate, and the skill and experience of the skater. While serious injury is rare, a number of short track speed skaters have been paralysed after a heavy fall when they collided with the boarding. A fall can be fatal if a helmet is not worn to protect against severe head trauma. Accidents are rare but there is a risk of injury from collisions, particularly during hockey games or in pair skating. A significant danger when skating outdoors on a frozen body of water, is falling through the ice into the freezing water underneath. Death can result from shock, hypothermia or drowning. It is often difficult or impossible for the skater to climb out of the water, due to the weight of their ice skates and thick winter clothing, and the ice repeatedly breaking as they struggle to get back onto the surface. Also, if the skater becomes disoriented under the water, they might not be able to find the hole in the ice through which they have fallen. Although this can prove fatal, it is also possible for the rapid cooling to produce a condition in which a person can be revived up to hours after falling into the water. A number of recreational and sporting activities take place on ice. Broomball and curling are also played on ice but the players are not required to wear ice skates. Ice skater on Lake Neusiedl. Skating in Central Park (1900), one minute silent film by Frank S. Armitage. EYE Film Institute Netherlands. Documentary on the World Championship Skating for Women at Helsinki in 1971. ^ Federico Formenti & Andrea Seabrook (26 January 2008). "The History and Science of Ice Skating". NPR. ^ Formenti, Federico; Minett, Alberto E. (2007). "The first humans traveling on ice: an energy-saving strategy?". Biological Journal of the Linnean Society. 93: 1–7. doi:10.1111/j.1095-8312.2007.00991.x. ^ "'Imperial' ice skating". People's Daily Online. 20 February 2013. Archived from the original on 17 March 2016. ^ Bird, Denis L. "NISA History". NISA. Archived from the original on 22 September 2008. Retrieved 28 October 2014. ^ "Figure Skating". The Canadian Encyclopedia. 2011. Archived from the original on 7 June 2011. ^ "Ice Skating". followthebrownsigns.com. Archived from the original on 28 October 2014. Retrieved 28 October 2014. ^ Goodman, Neville; Goodman, Albert (1882). Handbook of Fen Skating. London: Longmans, Green and Co. OL 25422698M. Archived from the original on 10 June 2015. Retrieved 15 March 2013. ^ Greiff, James. "History of Ice Skating". Scholastic Corporation. Archived from the original on 29 December 2017. Retrieved 26 February 2014. ^ a b Cycling, 19 January 1895, p 19. ^ "The History of Long Track Speed Skating". NISA. 18 July 2014. Archived from the original on 28 October 2014. ^ DL Bird 1979 Our Skating Heritage. London. ^ Chang, Kenneth (21 February 2006). "Explaining Ice: The Answers Are Slippery". The New York Times. Archived from the original on 11 December 2008. ^ Somorjai, G.A. (10 June 1997). "Molecular surface structure of ice(0001 ): dynamical low-energy electron diffraction, total-energy calculations and molecular dynamics simulations". Surface Science. 381 (2–3): 190–210. doi:10.1016/S0039-6028(97)00090-3. Most studies so far were performed at temperatures well above 240 K (–33 °C) and report the presence of a liquid or quasiliquid layer on ice. Those studies that went below this temperature do not suggest a liquid-like layer. ^ Roth, Mark (23 December 2012). "Pitt physics professor explains the science of skating across the ice". Pittsburgh Post-Gazette. Archived from the original on 13 January 2013. It used to be thought ... that the reason skaters can glide gracefully across the ice is because the pressure they exert on the sharp blades creates a thin layer of liquid on top of the ice... More recent research has shown, though, that this property isn't why skaters can slide on the ice... It turns out that at the very surface of the ice, water molecules exist in a state somewhere between a pure liquid and a pure solid. It's not exactly water -- but it's like water. The atoms in this layer are 100,000 times more mobile than the atoms [deeper] in the ice, but they're still 25 times less mobile than atoms in water. So it's like proto-water, and that's what we're really skimming on. ^ "Slippery All the Time". Exploratorium. Archived from the original on 19 July 2012. Professor Somorjai's findings indicate that ice itself is slippery. You don't need to melt the ice to skate on it, or need a layer of water as a lubricant to help slide along the ice... the "quasi-fluid" or "water-like" layer exists on the surface of the ice and may be thicker or thinner depending on temperature. At about 250 degrees below zero Fahrenheit (–157 °C), the ice has a slippery layer one molecule thick. As the ice is warmed, the number of these slippery layers increases. ^ Science News Staff (9 December 1996). "Getting a Grip on Ice". Science NOW. Archived from the original on 28 May 2013. ^ Rosenberg, Robert (December 2005). "Why is ice slippery?" (PDF). Physics Today. 58 (12): 50–54. doi:10.1063/1.2169444. Archived (PDF) from the original on 23 February 2014. Retrieved 15 February 2009. ^ van Leeuwen, J.M.J. (23 December 2017). "Skating on slippery ice". Scipost. 03: 043. doi:10.21468/SciPostPhys.3.6.042. ^ Oosterkamp, T.H. ; Boudewijn, T.; van Leeuwen, J.M.J. (12 February 2019). "Skating on slippery ice". Europhysics News. 50: 028. doi:10.1051/epn/2019104. ^ "World Barrel Jumping Championships 1958". British Pathé. Archived from the original on 4 March 2016. Retrieved 7 December 2015. Formenti F. and Minetti A.E. (2008) The first humans travelling on ice: an energy saving strategy? ice skating. Wikimedia Commons has media related to Ice skating. Look up ice skating in Wiktionary, the free dictionary. Wikivoyage has a travel guide for Ice skating.